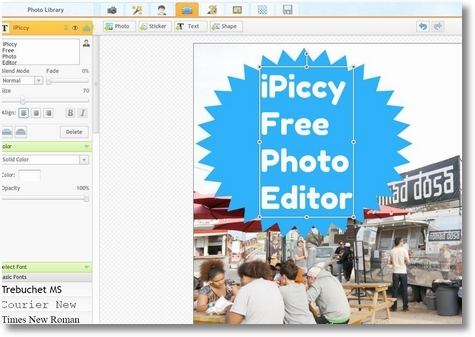 Free photo editing has never been easier or more feature rich. Tools and websites designed to crop, edit, and enhance your photos are almost as abundant as places to share them! It’s no secret that I’m a Pinterest fanatic (EverythingEtsy on Pinterest), I love Instagram, and I’m in constant need of photo editing for my blogs and Etsy shop. My guess is you do to, right? Even though I have Photoshop, I’ve been doing lots of my work using PicMonkey. We’ve written about using picmonkey for photo editing and Tim did a tutorial and video to demonstrate using PicMonkey to create a blog button or Etsy Banner. Today I found a new (to me) site that just might turn out to be my new go-to website for photo editing, especially if I need to do a collage, which I do all the time. iPiccy.com is very powerful and full of great features. It’s a tiny bit more effort to learn than PicMonkey but most of the tools and steps are easy and intuitive if you’ve got any photo editing experience. The extra features are totally worth the effort, and there is no cost at all. I haven’t used it enough to offer a full review of iPiccy, but I can point out a few of the things that I liked and were different than PicMonkey. The first thing I noticed was that iPiccy wanted to store my work on my computer rather than online. That involved allowing it permission which kind of freaked me out a little. 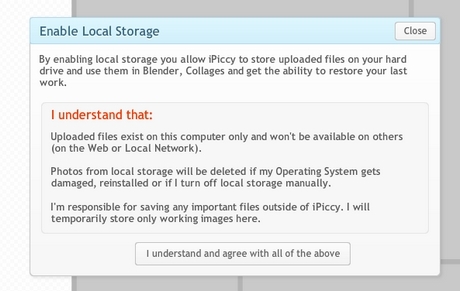 But since I really wanted to try it, I took the time to Google “iPiccy Local Storage” and didn’t see anything negative in the search results so I gave it a try. As it turned out, I really liked the features that local storage opened up. 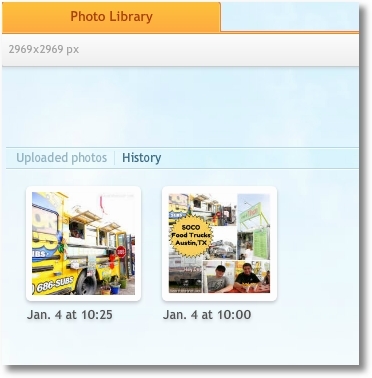 You have a photo library of all the pictures you’ve uploaded to iPiccy as well as a “history” tab where all of your finished picture saves live. This is in addition to the normal file location on your computer. Overall, I found working with the iPiccy storage easy and very helpful compared to the way you have to upload one thing at a time to PicMonkey and do that again for every time you work on a photo, even if you’ve worked on it before. iPiccy seems better here though I am curious why the history shows the picture saved on Jan. 4 when it was Jan. 24 (no big deal I guess…). 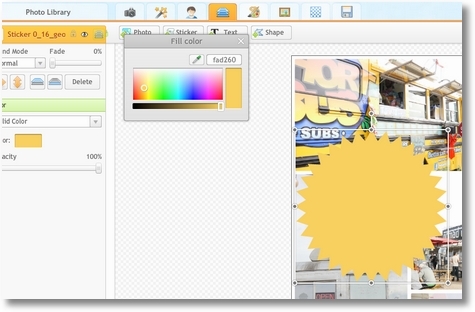 It was easy to adjust colors in iPiccy for things like added text, overlays (called “stickers”), and shapes. I also really liked having easy access to the eyedropper tool which allows you to select a color from within your image. That’s great when you want to use a matching color for your text or shapes. 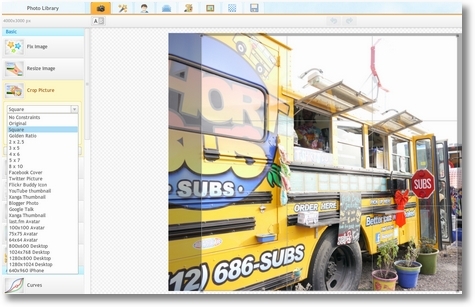 iPiccy also shows you the new color on the screen as you move the color selector around. It might be hard to see in the image below, but iPiccy has built-in cropping sizes for many of the major Social Media sites. Need a Facebook Cover Image or a background image for your iPhone, it’s already built-in as an option in addition to all the standard options such as square, 4×6, 8×10, etc. Now if they would just add some Etsy Banner sizes we’d be cookin’. This feature was one of my favorites. The collage options here were much easier to use than PicMonkey. First of all it seems like there are quite a few more options to choose from. Secondly, you can see them all without having to click on curious terms like “Biggie Smalls”. Finally, once you’ve selected an arrangement you can adjust the aspect ratio of the collage which can be helpful if you’re having a hard time making a picture fit just right. iPiccy has ALL of the bells and whistles. You have a full set of adjustment tools such as Brightness, Contrast, Hue, Saturation, etc. as well as a great selection of effects such as HDR, Sepia, and lots of cool vintage effects. One of the things I love about PicMonkey is the font selection so I was really pleased to see that iPiccy has a great selection. 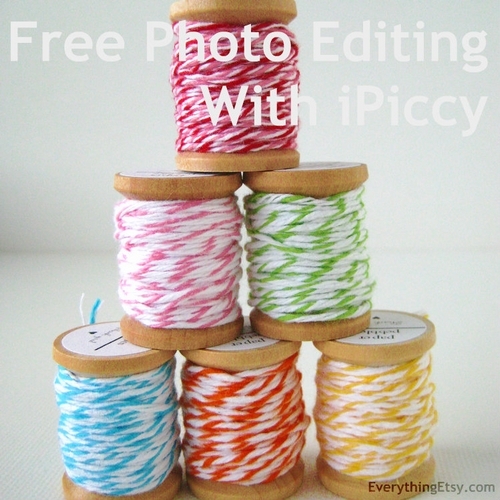 Maybe not quite as extensive as PicMonkey, but huge and all for the same price (free). I pay extra on PicMonkey to get all the fonts. Font editing is easy. Change colors, alignment, opacity, and font size in no time flat. I’ll keep using iPiccy for awhile and let you know how it works over time. I haven’t used it enough yet to know if it’s glitchy or does anything totally horrifying. If it continues to do well I’ll get Tim to do some tutorial videos to really show how it works. Am I ready to give up Picmonkey? Not yet. I’m still pretty in-love with that site, but iPiccy.com is one to watch and one you might want to try. Any photo editing tricks you’d like to learn? What’s your biggest picture editing challenge? What’s your favorite free photo editing website? I love these posts with blogging tips. I’ve learned so much from them and bookmark them for when I have questions. Thanks for doing them! Wow! I just used iPiccy and it is great! I also use Picasa and was hooked on picnik. Picnik is still in Picasa, but without some of the features that I loved such as layering and the cool textures. iPiccy is GREAT! Thanks for letting us know about this. Thanks for blazing the trail for us on this site! I’ve been using PicMonkey, but this Ipiccy sounds even better, I like the fact that your photos can be saved to your computer and the vast array of collage options. Many thanks for sharing this very useful info, Kim. I would love to see a tutorial on how to remove backgrounds from a photo. I use one I downloaded for free off of cnet called IrfanView and it’s okay, but just okay. I’m going to have to give this one a try. BTW, discovered your site via StumleUpon and LOVE it! It’s simply an amazing resource. Will be referring to it often! I am going to have to try this one. I do use PicMonkey & it was free when I started using it, now some up the things are upgraded & you must pay. Blah!